Pete Aguilar represents the 31st Congressional District of California. He was re-elected in 2016 and serves on the House Appropriations Committee. 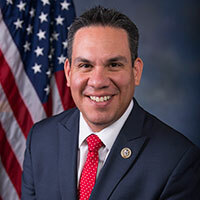 In the 115th Congress, Rep. Aguilar holds the leadership positions of Whip of the Congressional Hispanic Caucus and is an Assistant Whip in the House Democratic Caucus. Representative Aguilar is a voice for middle-class families throughout San Bernardino County and prioritizes legislation that will nurture a more fair economy where everyone has the opportunity to succeed. He is committed to policies that create jobs, reform our broken immigration system, support our students, and safeguard vital programs for seniors and veterans. He resides in Redlands with his wife Alisha and their two sons.